TOE-TALLY COOL. Coach John McCrackin, left, and 13-year-old Antonio Cruz, one of the students aiming for the USA Taekwondo Nationals. My first cognition of taekwondo – as it may have been for you and much of the public – was in September 1988 during the Summer Olympics in Seoul, South Korea. This was its Olympic debut as a demonstration sport, and taekwondo was fresh to those of us whose awareness of martial arts was limited to karate. 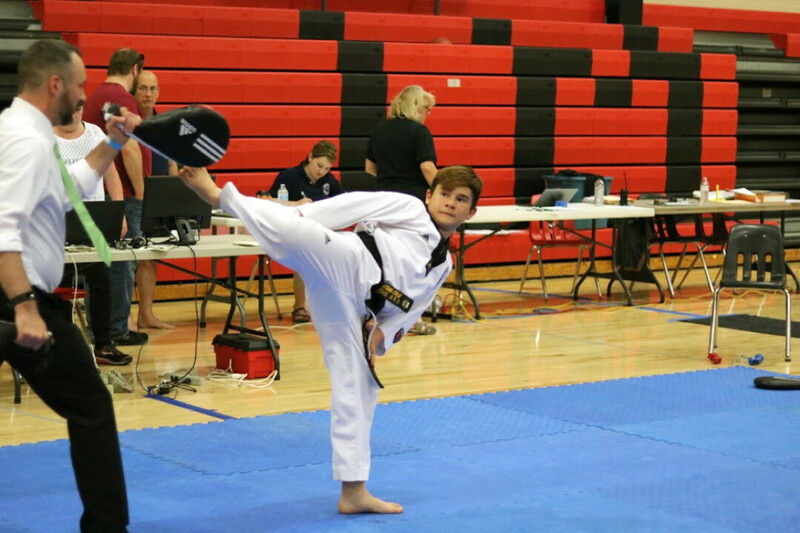 In the ensuing three decades, taekwondo has continued to spread across the United States. This summer, a team of young athletes from around Eau Claire could become national champions. In a matter of months, it is possible that youngsters from Northwoods Elementary, DeLong and South Middle schools, and Memorial High School could be tops in America. In July, USA Taekwondo Nationals are coming to the Twin Cities, the closest the national competition has been to the Chippewa Valley in a decade. However, just because the best of the best are congregating a little west of here doesn’t guarantee our area athletes will be in the running. In order to compete on a national basis, collaboration is critical. McCrackin notes how, in order to grow the caliber of talent to match what is found elsewhere in the country, his team and others in Wisconsin have networked with each other and engaged in camps and tournaments across the Badger State. For McCrackin’s team, the training began with the start of the year. “The constant focus is always conditioning, agility, and skill-building through a three-phase process,” he said. Phase 1 was the late-January Badger State Games. “We used the (games) as a launching pad to validate our strengths, and address our weaknesses.” The haul: nine gold medals, six silvers, and a bronze. Phase 2 is now underway, applying the learned techniques and culminating with the March Minnesota State Championships to qualify for the summer Nationals. Following early-April’s Park Institute Pan American Taekwondo Tournament, his team will focus on conditioning in the lead-up to what will hopefully be a hearty presence at Nationals. “It is important that we peak physically in July and not get burnt out,” McCrackin noted. Knowing this, perhaps you want to try taekwondo. Perhaps you think your child should take up the martial art. While there may be a variety of motivating factors – “physical fitness, character building, competition, etc.” – John McCrackin knows something even more substantive and enduring will keep taekwondo in one’s life: “What keeps people coming back are the relationships you build, new goals to achieve, and ultimately the giving back portion that’s attained through teaching and coaching.” His team’s road to the Twin Cities has an ultimate destination: an endlessly rewarding life.